Concerns over Barcelona-based Flightline outlined as BBC radio programme hears how survivor’s recollection of the horror crash. 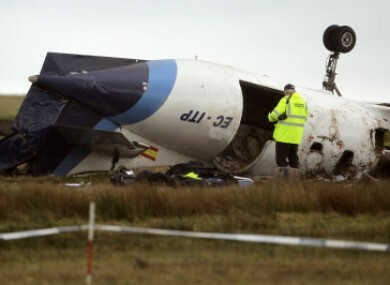 THE OPERATOR BEHIND the Manx2 flight which crashed at Cork airport on 10 February, killing six people on board, is “in danger of losing its licence”. Barcelona-based aviation company Flightline, which subcontracted the Belfast-Cork route to Manx2 staff, has been warned that it will lose its operator certificate if it doesn’t come up with “a corrective plan to address several immediate safety concerns”. A BBC Radio4 programme in the Face the Facts series, due to be aired today at 12.30pm, is to reveal that Flightline was hauled in front of the European Commissions’ Safety Committee last month, following which it has had to promise to revise its procedures over pilot selection and change its company manual on the use of alternative aerodromes (The preliminary report into the Cork air crash found that the inexperienced pilots on board attempted to land the plane in heavy fog of Cork, instead of diverting to an alternative airport). It also has to come up with a corrective action plan to address several immediate safety concerns. The British Airline Pilots’ Association (BALPA) is calling for tighter rules on these ‘virtual’ airlines, such as Manx2, which sells seats but where all these other things, the craft, the pilots, are subcontracted in. Pilots are seriously concerned about these virtual airlines. The day is going to come, and the public should realise it, that whether when you get onto an aircraft, you should ask yourself some serious questions. How is this airline operated, who is in the front of the aircraft, how is this aircraft maintained. The (British) government and regulator need to step in to stop this drift into a virtual world of aviation. As we came through the cloud I realised it was fog because we were only about 30 feet off the runway, still travelling very fast and we seemed to be to the right hand side of the runway. I did shout out that I thought that we were going to crash. Immediately I thought we were never going to land this safely. I shouted out, “We’re going to crash, we’re going to crash”. A few people screamed and then the plane lurched fairly violently to the left, fairly violently to the right and I was looking out the window, at this point we were still descending. The wing tip, where I was sitting next to, just hit the runway, we flipped over onto the back and then slid off the runway into this mud and there was screaming and shouting, the sound of glass breaking, all the windows smashed. And then we came to rest. The ex-policeman said that he thought several times that he was going to die. We ended up sitting upside down and I started to get very wet and for one awful moment I thought we had landed in a lake or river or something and we were all going to drown. I couldn’t move, I was trapped underneath seats that had come loose, people still in those seats, bags and things and I was wedged in underneath. My feet were trapped under the seat in front and I was wedged in between my seat and the ceiling of the plane, which was now the floor. As I looked around, all I could see was a lot of dark mass, because the plane had flipped over and the windows had smashed it had filled with mud. The seats in the plane were dark blue leather, the plane was fairly dark. As it had been a cold morning, everyone had been wearing big overcoats and things, so all I could see around me were big dark shapes. There were people in chairs on top of me, and I could hear screaming, moaning, shouting and then I heard another passenger shout, ‘We’re on fire, we’re on fire’. Unfortunately, experience has told me that people make a certain noise when they’re taking their final breaths and I had heard those sort of death rattles. I had heard those noises in the plane. Once the emergency services got in and they started to move people around, I started getting into more pain because by its nature, they were moving people off me, which was causing seats to crush down on me. I started getting more and more pain then and I closed my eyes to try and focus on things and shut things out so I wasn’t really thinking of anybody else at that point, if I’m honest. Mark Dickens went through check-in, saw staff with the Manx logo on their shirts, got on a flight with the Manx logo but it wasn’t the company responsible behind it at all. Email “Aviation company behind Cork air crash 'in danger of losing its licence to fly'”. Feedback on “Aviation company behind Cork air crash 'in danger of losing its licence to fly'”.